The new Martin Mac 550 features unprecedented illumination for a 400W fixture, astounding graphics and animation, all wrapped within the award winning design of the MAC 2000. Combined with its motorized zoom and new color and gobo motors and unique gobo animation system, it is a small revolution in the world of quiet, mid-sized fixtures. The MAC 550’s variable motorized zoom and focus expands the beam continuously from 14° – 30° with high precision and sharpness. 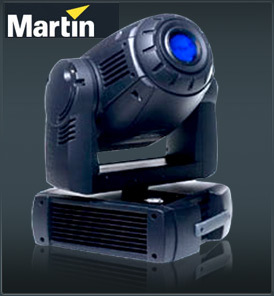 The Martin Mac 550 features a DMX–controlled gobo animation system - unique to a mid-sized luminare. It is specially engineered to create animated effects such as clouded skies, reflective seas and flames. The system comes complete with one animation wheel, with further wheels available to expand your library. Each wheel is quickly changed via a magnetic coupling without the use of tools. The Martin Mac 550 features two color wheels, each with eight slots plus open. As with all products in the MAC family, ergonomics and functionality are paramount. In the 550, the color selection may be changed with ease to offer you a seemingly limitless array of color combinations. Glass, textured glass or metal gobos fit within a six-position rotating & indexing gobo wheel, (plus open) and a nine-position static gobo wheel, (plus open). The gobo system permits 16-bit control for extreme accuracy with all gobos easily interchangeable, removing any obstacle to your creativity. A bi-directional, 3-facet prism rotates at variable speeds, adding unique effects to gobo projection. The prism can also be replaced giving lighting professionals further options for customization. A motorized iris allows you to resize the beam quickly and accurately for fast effects with smaller beam sizes. The Martin Mac 550 employs an intelligent position correction system that automatically returns the luminare to its original position, should it accidentally be knocked out of place. A multi position tilt lock mechanism is also featured to permit easy maintenance and handling. A full range dimmer/shutter is very accurate and allows for smooth color and effect transitions by varying the intensity of the light output. Accelerated strobe effects are possible up to 20 Hz. The 550 also contains head and base temperature sensors to ensure that fan speeds are kept to a minimum; bringing noise levels right down. The design of the Martin Mac 550 is unashamedly inspired by the larger MAC 2000. This award winning design is highly efficient, making service and maintenance easier with fast access to modules and critical components. A switchable power supply covers worldwide voltages and frequencies allowing the fixture to operate anywhere in the world. The Martin Mac 550 contains head and base temperature sensors to ensure that fan speeds are kept to a minimum; bringing noise levels right down to suit theatre and TV studio applications. The Martin Mac 550 is DMX512-controllable, equipped with both 3-pin and 5-pin XLR in/out sockets, and totally compatible with coming future standards such as ACN or Ethernet-based protocol.